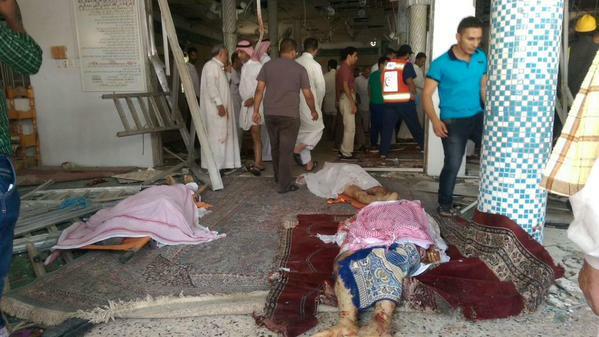 JNN 22 May 2015 Riyadh : A suicide bomber has blown himself at a Shia Sect mosque in the east of Saudi Arabia during Friday prayers. Local residents say the explosion has killed and wounded at least 30 people. The blast took place at the Imam Ali mosque in the town of al-Qadeeh, Qatif province. One witness said there were at least 30 casualties in the attack, where more than 150 people were praying. “We were doing the first part of the prayers when we heard the blast,” Kamal Jaafar Hassan, one of the worshipers, told Reuters by telephone from the scene. Another eyewitness told the Middle East Eye that at least five people have been killed and 20 have been injured. The Saudi state has confirmed that an explosion took place at a mosque in the east of the country and said more details would be provided later. Photographs from the scene show bodies strewn across the floor, while emergency vehicles are already at the site of the blast. Inside the mosque, glass has been shattered; pieces of concrete, perhaps from the ceiling, are littered across the floor. The al-Qadeeh town is home to Saudi Arabia’s Shiite minority, in a country which is predominantly Sunni. Saudi Arabia has been threatened by Islamic State, which is formed with the Help of funding from the US and the Saudi Government , as the IS also follows the Wahabi Ideology which even confirms the fact that it has been sponsored by the Saudi Government , but on the official record Both the US and the Saudi Government denies any funding , rather they claim to target the IS , as they have always done with the Taliban in the Afghanistan, which was even Years after Hilary Clinton have even admitted that we created them , and Saudi Arabia financed and Nurtured them with Wahabi Ideology , but on the Official Record US Invaded Afghanistan , in order to target them and Annihilate Taliban , who are till this day neither being Annihilated nor the fight against Taliban has been ended , as the Drama till today continues in Afghanistan. Shiites make up around 10-15 percent of the Saudi Arabian population. They are mainly based in two districts in the Eastern province, not far from Bahrain, in Qatif and al-Ahsa. Both areas have historically been the focal points for anti-government demonstrations, according to Al Jazeera. Shiites living in Saudi Arabia have regularly complained Protested against the discrimination by the Wahabi government, which is a charge they deny. But the facts on the ground contradicts the Government claims as thousands of Shia have been jailed , without any charges for Years , and the Latest is the case of Sheikh Nimr al Nimr , who have even been sentenced to Death by the Saudi Court , for No Crime of His , Rather for Just asking for rights for the Shia Population of Saudi Arabia. Saudi Arabia’s Shia population is mostly based in two oasis districts of the Eastern Province – Qatif on the Gulf coast, and al-Ahsa, southwest of the provincial capital al-Khobar. Qatif and al-Ahsa have historically been the focal point of anti-government demonstrations. The kingdom’s Shia community accounts for between 10 to 15 percent of the total population. They say they face discrimination in seeking educational opportunities or government employment and that they are referred to disparagingly in text books and by some Sunni officials and state-funded clerics. They also complain of restrictions on setting up places of worship and marking Shia Religious Days, and say that Qatif and al-Ahsa receive less state funding than Sunni communities of equivalent size. This entry was posted in Middle East and tagged Imam Ali Mosque, Qateef, Qatif, Saudi Arabia, Saudi government, Shia Worshipers, Suicide Blast, Wahabi Terrorists. Bookmark the permalink.